It’s been a pretty trying week, for me. Rather than try to rush through finishing a comic in time and post something I knew would be sub-par, I decided it’d be better to put it off a bit (although, clearly, I did want to draw something, so I put this together in one of my graph notebooks at work, heh). Stoli passed on this week – it wasn’t sudden, he just got old, but it’s still weighing on me a bit (for those who saw the news on my social media earlier, thanks for your kind words and condolences – I’m fine, just need a little time). If you noticed the downtime earlier this week, we got hit by a DOS attack — we weren’t “hacked” (they didn’t get access to anything on our server) but they were flooding the site with requests designed to overload and bring down the server. Most likely not a specific attack, just one of those jerks that scans around looking for WordPress vulnerabilities. Fox saved the day on that one, got us back online, tightened up security overall, and gave me some homework I’m still working on to harden things even further. Still a couple of things left to manage (you’ll notice little details like our custom smilies are still missing, oops) but I think we’re back to ‘stable’ again! This is a good time to note that I was trying to keep status updates going on Twitter or Tumblr, so let’s hope we don’t go down again, but if it happens, check there for updates! Finally, if you’re curious about the hard hat, Fox and I are both members of our local CERT – Community Emergency Response Team, and I’ve been enjoying helping out with their training sessions lately. CERT training is based around disaster response, and what we as civilians can do to help ourselves and our communities if “the worst” happens, and professional First Responders are delayed. It’s incredibly interesting, and in most cases, very inexpensive or even totally free (ours was a whole $15, mostly to cover bringing in lunch for us after our final exercise). If you’re in the US, the link I posted above will let you look for a program local to your area. Thanks all of you for your patience, since I wasn’t sure I could pull off “funny,” I wanted to provide something at least informative / maybe a little interesting? I’ve already taken a couple of days off from my day job this week, so I can rest up and get back up to speed. Oh no. 🙁 I’m sorry to hear you had a tough week. May Stoli rest in peace. And I hope you get some good rest too. So sorry to hear about Stoli. I hope everything gets back to normal for you soon. *plays soothing music and dims the lights* rest well Mandy we all have those weeks. A good comic like yours is worth the wait. Rest up and take care. Take all the time you need, and again I am sorry for Stoli passing away. Unless the bot was setup to disguise its origin IP address in theory that’s actually rather easy. The problem is that the type of bot attack they described eats up so many system resources that the server wouldn’t be able to run the code to track it and release the counter virus on it. Also, having ANY kind of response go to the bot’s origin IP address tends to give more information about potential vulnerabilities in your system than you’d ever want any hacker/cracker to know, and the bigger the response the more information they can potentially glean, which most times makes it a more dangerous route to take for keeping a system secure (not to mention the fact that you might end up with your site being labelled an ‘Attack Site’ for the extra ‘security’). Good points. Actually though, I was thinking of a small-time, private thing, not business sized. (Would first have to research what, if anything, one could legally(?) get away with too of course.) Build a minimal site (with no personal info.) on old, junk equipment and set up for easy rebuilding if the bot wins. Per your post, I suppose one would have to figure a way to have some separate, reserve resources to run the trace and counter. The other catch is that a bot attack is probably a distributed attack being launched by a possibly-global array of computers without their owners’ knowledge, let alone consent. Iron Ed, for your problem see if a script blocker like ScriptSafe might help. Thanks, I’ll ask about that! It still won’t help punish the perpetrators though. Actually it might. See, some of those ads earn money for the website they are placed on every time they are loaded, with several more earning money for that site every time they are clicked (and many of the first type of earnings do the second as well). However, and this is based on what a site manager posted one time when he tried to get his site to go subscription free, when you run any adblockers and/or scriptblockers it prevents those ads from loading, and thus from earning the website hosting them any money. So, in an indirect way it can actually punish the people who have browser breaking ads on their sites. I do feel your pain to, the computer I use for reading my webcomics is an older gal and there are a couple of webcomics that occasionally the ads on them cause her to lag horribly. In fact, earlier today I almost had to reboot her it was so bad, and ever since one of the comics I used to read ended last year (and was removed from my list) I hadn’t come that close in quite a while. Of course I’m also loading up 10 separate tabs at once which drastically increases the load on my Lilith-rin. Check around some then, I’ve heard rumors of ad-blockers that will let you select specific sites to not-block the ads of (or are generally off except for specific sites you tell it to block). I don’t think they are free, and I don’t use them myself since my Lilith-rin is a Linux box so none of the viruses are correctly configured to affect her, but there just might be a solution out there that works for you without requiring you to do something drastic. That’s likely to punish the wrong people too. Webmasters generally don’t know anything more than a vague general sense of the ads that run on the site either, unless their users tell them. That actually depends a lot on the source for the ads. Something lik Project Wonderful ads the Webmaster never knows what specifically is being advertised on the site, just that there are ads (and that the banners have fixed sizes allowing for ease of page layout with them). Independent ad banners though (the ones that are always for the same site and not part of a group advertising thing) do leave the Webmaster with a very specific idea of just what ads are on the site. In my experience the worst of the browser breaking ads are independent ad banners, usually for some type of scam, rather than something like a Project Wonderful ad, not to say I haven’t had a couple of them be problems before, it’s just a lot less common. Yes, most of the time it is best to inform the webmaster or site admin about problem ads, but it doesn’t always work and having a backup plan to keep your computer functional if it doesn’t isn’t exactly a ‘bad thing’ either. I would also like to point out quick like that the webcomic that gives me the most trouble is a syndicated comic and the problem ads are mostly the syndicates on ads for other things they have a hand in. Then again that one page has as many ads on it as the other 9 in it’s ‘set’ of my list combined. Simply put the webmaster allowed way to many ads onto a single page making it nearly useless to utilize, and half of the problem comes from the webmaster’s boss(es) leaving him/her in a situation where nothing can be done about it. hehe take care of yoruself ) and sorry about the hamster. We all stand behind you in spirit, Mandy! Also, that is the best depiction of a bot attack ever. 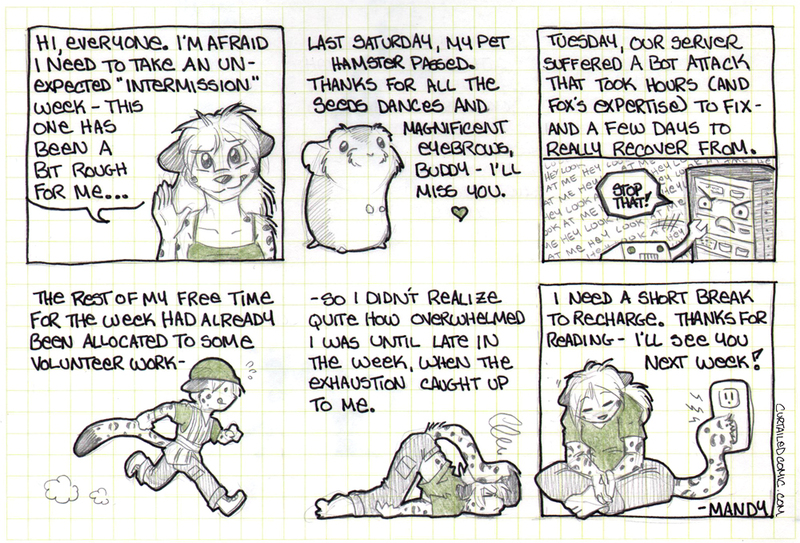 The last two panels are absolutely priceless Mandy…..and illustrate/portray your situation perfectly. *Soft, giant wolfie hug* Deepest sympathies on Stoli’s passing. I’m glad to here that you’re still hanging in there. As for the CERT site, according to it I live a little over 20 miles from the nearest CERT group, which is in a different county than I live in (actually, all of them within a 50 mile radius of me are county based). Sadly, there were four other counties whose names and locations I can place that also didn’t have a CERT group aside from my own. I’d try to say I was surprised, but considering I hadn’t heard of them before you mentioned them here (and a few years ago a tornado grazed the town I live in) I’m actually more surpised that there were as many as 7 within a 50 mile radius of where I live. Seriously, I did a 50 mile radius just in the hopes of getting 2, and one of them I was expecting wasn’t even there. Thanks for keeping us informed and I hope that you are feeling better soon. Take all the time you need and we will wait [im]patiently for you to finish recovering. Take care of you, the comic can wait, and your fans will still be here after. You are too good to miss just because you need some down time so I, for one, will be patiently waiting in my greenhouse, watering my tomatoes. This most definitely counts as a comic. Thank you for putting what probably amounted to as much effort as a regular comic, given the circumstances, into entertaining us instead of just saying “see you next week instead” which you have every right to do. This is your house, not ours, but thank you for letting us in. The good side – albeit of a different sort – you are already used to dealing with disasters. This gives you more resilience than many of us. Recharge in peace – we can wait for the joy your comics bring. Please take care, ok? I’m so sorry about your hamster and I hope you’re alright. You have good taste, Fox! I have to say, I’m sorry about the things you’re going through, but you did a great job of making the explanation entertaining. Thanks for putting the effort into making it more of a comic than a wall of text. Feel better; take your time. You put up a page with that much artwork and called it filler?! I’m impressed. Also, WordFence works great for blocking out bot attacks. Plugin based solutions are ineffective against this particular threat vector. I don’t know exactly what kind of problems you had to face, so I can’t honestly say that it would be effective, but I will say that I personally was surprised as what that plug-in could do. It diverted a lot of a blunt-force attacks. Keep up the amazing work, and whatever you volunteered for I know benefited from. I have been (guess the right term is lurking) for a long time, but just want you to know that your health and stamina is more important than an update no matter how much anyone looks forward to the joy you bring our lives! Thank you for all the wonderful comic updates, rest well, and know you have at least one reader for life! And here I thought I was the only one that ever charged up sticking my tails in power sockets. 1. Poor Stoli… But he’s in a better place now. 2. Bot attack? Just another reason to hate people, I guess. Take a break, Hon. There’s no rush, really. With guns, it’s better to have a slow hit than a fast miss. I’m certain the same is true for making comics, and life in general. It’s not about quantity. It’s about quality. My condolences for Stoli, I know how hard it is to loose a member of the family especially the furry ones that provide such love. He will be missed by one and all. You have my condolences at the loss of your hamster. I just lost my dog on Saturday, so I’m in the same boat. It doesn’t matter how big they were, when we lose a fur baby, it hurts. May Stoli and Nommie (my pet rat I had to put down) meet on the rainbow bridge and plan the most daring seed heists the Other Side has ever seen and know happiness. Hey – Another Cert member! Woo-hoo. We are small but mighty, right? Training days can be exhausting, but I always feel good when we go. Anyway, marvoulus art as allways, It’s a nice stile – the bold outline and paler details. Take all the time you need to recover. We can wait. See you next week Mandy. Blesses for you and fox. You’re a wonderful artist, Miss Seley, and thanks for doing a comic when things are so hard for you. Your art cheers me up everytime. I always do these for artists I follow when a pet of theirs passes away. I use a photo of their pet and print it on canvas and mount it on a small piece of foamboard. Free of charge of course. Email if you are interested or even if you’re not. Here is one example. Hello there! As a new reader, I just wanted to say afew things. 1. I hope things get better for you in the very near future. 2. Your dedication is amazing, as is your art work, ability to keep with motivation, on point humor, and so much more. 3. The snark is strong with this one….I think I’m in love…with your work. 5. I oft use your comic strips as a reply to questions people ask me when I’m either busy, or (in most cases) your plot situations make for the perfect answers for various life instances. Welp, that’s about as much as my summer heat addled mind can come up with atm. Much love your way, and you can bet your fuzzy slippers (if you have em) that I’m going to share links to many of my friends. I enjoy spreading the addiction…I mean love. understandable , it been a rough week all around.